Our contest to win ONE of three XCM XFPS Fire Light Gun for PlayStation 3 is now closed! That's right, there will be THREE winners! All you had to do was post a comment here to be eligible. If you missed out, don't worry. We'll have more contests in the near future. XFPS Fire Light Gun brings console first person shooters to a whole new experience. Bring the entertainment to your living room! With the XFPS Fire, you can snipe your foes with precision aiming using this light gun. No more having to move your thumbs or getting cramps. Simply point and shoot. What makes the XFPS Fire Light Gun even better is that it works for ALL first person shooters and is compatible with all PS3 systems. CONGRATULATIONS! Winners will be contacted via PM for your mailing address. This information will be forwarded to XCM who will than ship the prizes to you. Please respond within 48 hours or your prize is forfeited and a new winner will be chosen. Overview : The AVRKey is PS3Key's open source solution similar to that of Teensy's and AT90USB's. 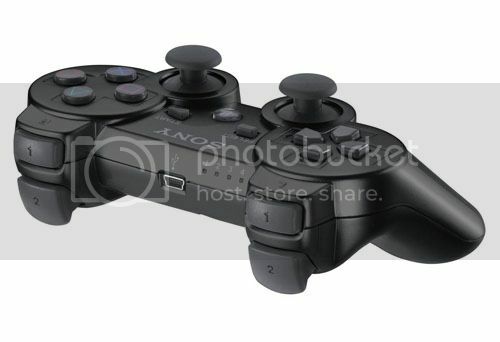 It will not break your warranty seal and is compatible with all PS3 models, both Fat and Slim. Easy-to-use software for backing up, managing, and playing games from external USB Hard Drive. 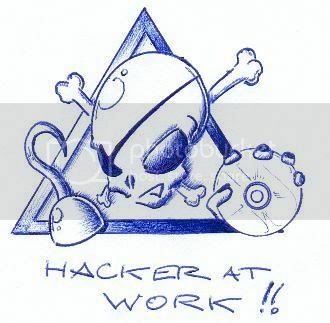 The AVRKey will supports installing homebrew application on PS3 and external USB media. AVRKey supports PSGroove .hex files. THIS DOES NOT WORK ON FIRMWARES 3.42 OR ABOVE UNTIL A NEW EXPLOIT/METHOD IS FOUND! IMPORTANT: The console must be completely switched off before using AVRKey. For fat versions, use the switch at the rear. For slim versions, simply remove the power cable. This is extremely important for the process to work correctly when you start the console. AVRKey are shipped blank allowing you to install your own .hex files. Quality/Usability : Also read our PS3Key review. There has been a lot of confusion between consumers and retailers since retailers are naming it AVR PS3Key or something along those lines. So lets start off by clearing the confusion. AVRKey and PS3Key are made by the same people, both look identical and both use the same hardware but are BOTH different products. The BIG difference between the two is that PS3Key comes shipped with their own proprietary firmware (.upd) file, own software that reads/loads .upd files. AVRKey are shipped blank...as in nothing. With AVRKey, you install your own HEX files (.hex)..the same files as PSGroove. IMPORTANT : PS3Key comes with YELLOW sticker. AVRKey comes with GREEN sticker. This is how you will know what you received. The AVRKey comes in an anti-static bag and on this bag is also a GREEN sticker. This sticker is your serial number and verification string. Unfortunately, there is no URL to enter this to see whether or not it is authentic or whatever the real purpose of it is for at the moment. Entering the serial and verification string at http://www.ps3key.com/en/validate/ will result in an error. This goes to show that AVRKey and PS3Key are two different products. The AVRKey is housed in a metal casing that looks exactly like PS Jailbreaks and PS3Key. There is also no writing or logo on the housing to prevent any problems with distribution. I personally would have liked AVRKey printed on it as it is a USB development board and is shipped blank. This also distinguishs the difference between AVRKey and PS3Key. The AVRKey measures approximately 1.25" (length) x 0.50" (wide). On the end of the dongle is a blue rubber cap. This protects the board from being exposed and prevent dust and other particles from entering as well as softens the brightness of the LED lights. Like PS3Key, AVRKey dongle is running on ATMEL MEGA32U2 (ATMEGA32U2) and is upgradeable via USB port. When I first received my AVRKey, the USB board was bent. 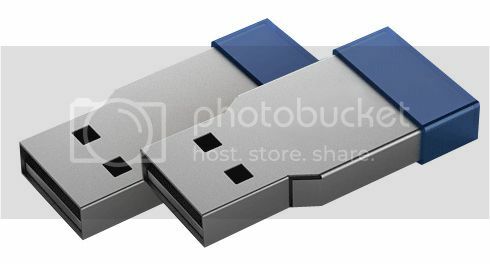 It could not be inserted into a USB port on my computer. So I had to take off the blue rubber cap, pull back on the 2 pins (they are very fragile and can break off if played with too much) and pull the board out. When the soldering was done to the USB and chipset, it was not leveled. I had to bend the USB down so that it was leveled with the board. I was afraid I would break it but didnt. Put it back into the metal housing, slowly closed up the pin and put back the rubber cap. 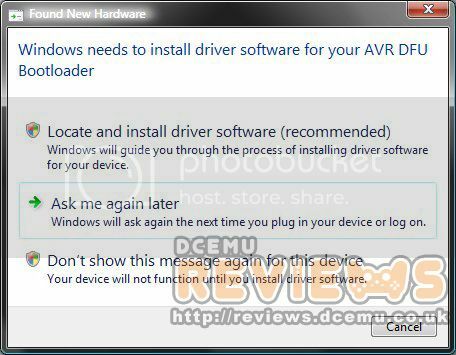 In order for the AVRKey to be recognized, you need to have driver installed. 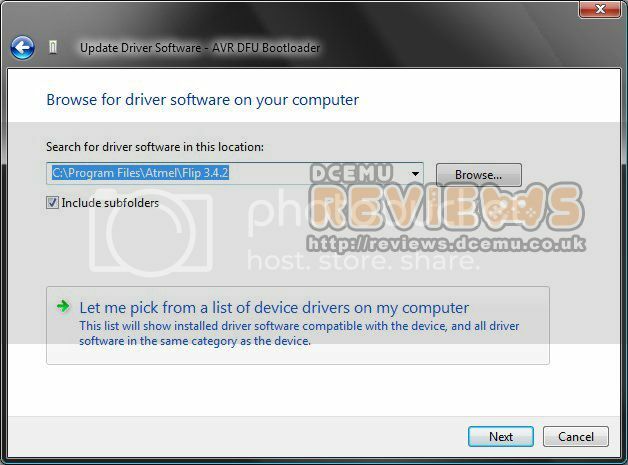 Click on "Locate and install driver software (recommended)"
To locate the driver, click on "Browse my computer for driver software"
Once you have FLIP downloaded, browse to where FLIP is located on your computer. 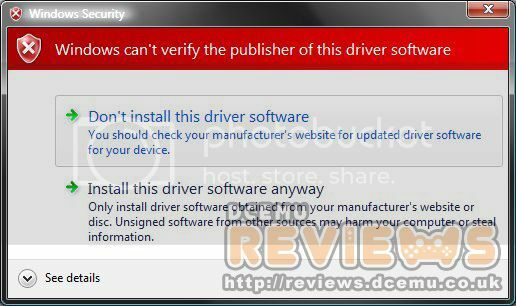 Windows Security may pop up with a warning message saying it can not verify the publisher. 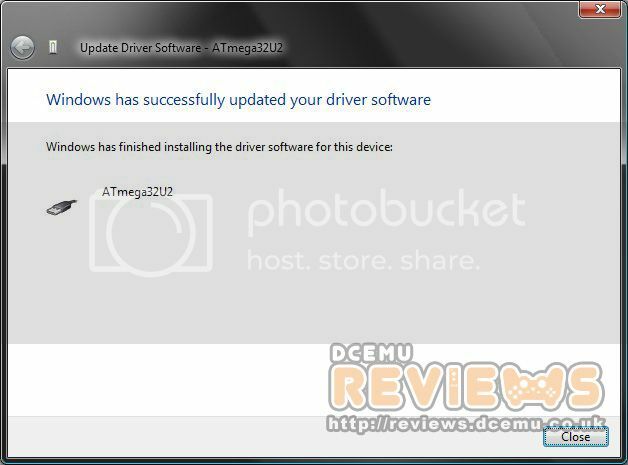 Ignore this and click on "Install this driver software anyway"
1. 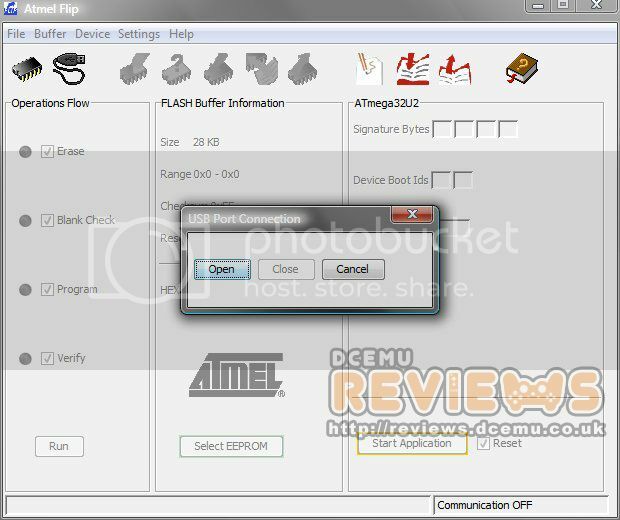 Start the FLIP program and click on 'Select a Target Device' (image of PIC chip next to USB cable). 3. Select "ATmega32U2" and click "OK"
2. Click on USB and a new window will open. 1. Click on FILE and "Load HEX File..."
2. A browser window will open and locate where you saved your HEX file. When completed and successful, the bottom status bar will say "Verify PASS". Remove dongle and insert into PS3. Insert AVRKey into a USB port on the PS3. In order to make sure the AVRKey dongle worked flawlessly, I had to uninstall all my homebrew applications that I had originally installed. 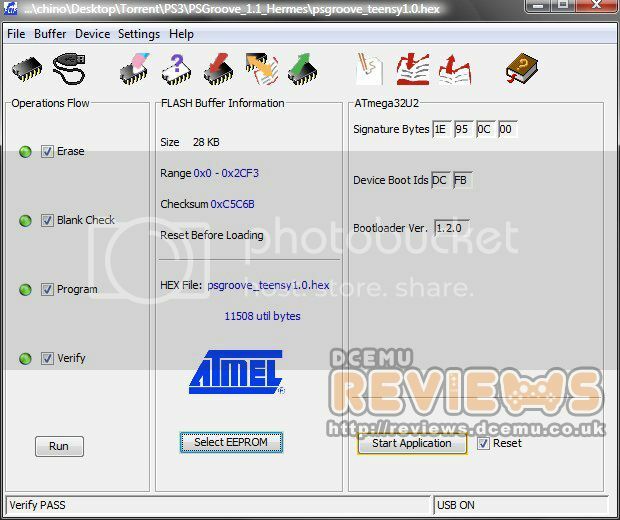 To install applications or any homebrew applications, you will need to download and save the .pkg files to a USB drive such as thumbdrive or harddrive. To install, simply insert USB drive to the PS3 and navigate to "INSTALL PACKAGE FILES" on the XMB under GAME. Select the file you want to install by pressing X and it will automatically install the file. All applications installed and loaded without any problems. There are no other files or programs available to download from www.avrkey.com. Since AVRKey uses PSGroove .hex files, I don't think there will be much released from AVRKey's website. 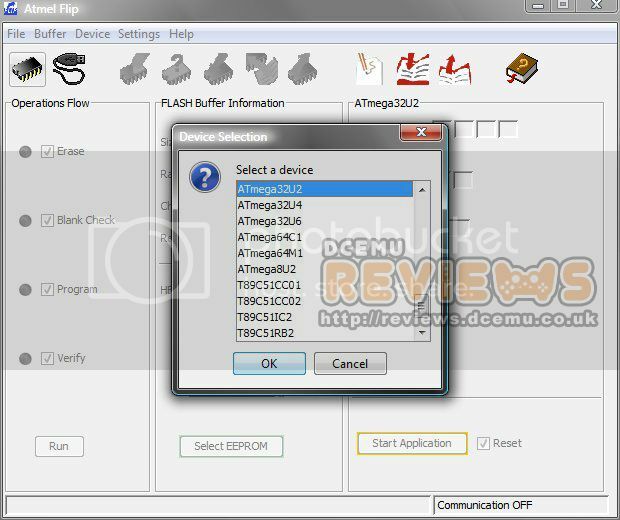 As of 10/1/2010, PS3Key has released an "open" version of the PS3Key firmware as a HEX file which can be used with other generic USB dongle devices and can be downloaded at http://www.ps3key.com/en/members/downloads/. Conclusion : Overall, the AVRKey AVR Key USB PSGroove Dongle is a great alternative to the Teensy's or AT90USB's...and probably better looking. The dongle is compact and light in weight. What's great is that you can install any HEX file whether it be PSGroove's (Teensy) or PS3Key's "open" version. But is a bit pricey. The AVRKey is priced the same as that of the PS3Key. My only complaint is that there is no logo or indication that its a AVRKey. It looks completely identical to the PS3Key. If you were to remove both from its anti-static bag and mix them up, you wouldn't know which one is which until you inserted it into the PS3 or computer. Depending on the HEX file and how it was compiled, there may not be any LEDs lit up that changes from red to blue to let you know it loaded successfully upon PS3 boot up. If you install PS3Key's "open" version (http://www.ps3key.com/en/members/downloads/), LED will be enabled. Those who have been holding back and wishing a PSGroove/PSFreedom was ported to that they can still keep OtherOS can stop wishing. KaKaRoto has ported PSFreedom over to 3.01 firmware on the PS3. I’ve got some great news for those of you who have not updated your PS3 firmware! I have just succeeded in adding Firmware 3.01 support into PSFreedom. I’ve pushed the latest code to github and you can now download the source and compile PSFreedom for 3.01. I will soon add support for firmware 3.10 and 3.15, so be patient, and you will be rewarded. I would like to thank Klutsh as well as Philippe Hub who helped me achieve this port to 3.01. The new payload changes are available in the PL3 github and any project/port that is also using PL3 should automatically gain support for the 3.01 firmware. You will also be able to enjoy some new ‘tools’ in PL3 that will allow you to dump the LV2 kernel as well as the decrypted ELF files of the XMB and other configuration files it uses. The ethernet dumping is also now compatible with PS3 Slim models. I would like to thank, again, those who have donated. For the others, you can still donate, if you appreciate the work I’ve done. Philhug and I have worked together recently to make PL3 compatible with 3.15, and it is now done, working and ready for you to use. I have just pushed the latest changes to github, so just update both PSFreedom and PL3, and define FIRMWARE_3_15 in PSFreedom’s config.h and recompile. You will then be able to enjoy your unrestricted PS3 on 3.15 firmwares. Enjoy! Clean your room or you won't get full experience with Xbox 360 Kinect! 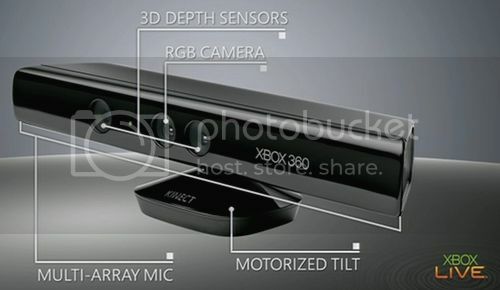 Microsoft has warned that messy floors "with clothes all over the place" will prevent Kinect from working properly. The company also advised against putting the sensor in "a noisy environment", using the examples "on top of your Xbox" and "on top of your subwoofer". "We rely on the floor for a number of different parts of the technology," said Mark Plagge, Kinect's senior project manager, during a . Over at PSX-Scene, garyopa, has posted some interesting information about how Sony is really taking this Jailbreak seriously. Lots of information as to who is involved and what Sony is doing. So not only is Sony going after sites that sell (of course), but they are asking the court they need to findout the true identify of everyone that sells, makes, offers for sale, or even has just knowledge of the real people behind any project called PSJailbreak, PSGroove, OpenPSJailbreak, PSFreedom. Sony is going all out! In an update to the court action against the owners of PSJAILBREAK, I have gotten all the possible recent court documents that are available right now at much personal cost to myself (money for documents), but I thought it would serve the public good to see what the Sony legal dogs are up to. In these boring legal filings by Sony, it now covers not just PSJailbreak, but also names PSGroove, PSFreedom, OpenPSJailbreak, and they have filed printouts from various blogs, forums, and sites like PS3NEWS with comments and tutorials people have been writing up on how to use these various programs. They even mention of course the phone ports & TI84 calc. hacks. Sony is using this information, to get the courts to order up faster service, to force the various ISP', Domain Register's, and Web Hosting Services to give up the personal info on their clients so that can serve more court papers on those people, and issue DMCA takedown notices to shut down various sites. So for the Judge has only granted one order so far, this one is directed to YAHOO! to within 5 business days to turn over all the information they have on a "vladgazoune@yahoo.com", all IP's he used to access his mail, his personal info stored by Yahoo, his email of course, and other logs. This E-Mail address is the one that was used to rent the mail-drop box in Texas used by http://shoppsjailbreak.com as their virtual office for orders, shipments, registering the domain name, etc. Recently, that above name site which also goes under the company name of Zoomba stop using the ".com" domain and now is operating under a http://shoppsjailbreak.net domain. -- Plus also the http://psjailbreakcanada.com site which seems to point IP wise to the older site, has suddenly been changed to DOJ/IPR/ICE notice that has been used in the past for "Torrent/Movie" site take-downs! Anyhow, here is all the public court documents you can read thru them now, and see just what SCEA has been printing out about yourself online, they are asking the court they need to findout the true identify of everyone that sells, makes, offers for sale, or even has just knowledge of the real people behind any project called PSJailbreak, PSGroove, OpenPSJailbreak, PSFreedom. Don't be surprized if the next few days, you see less sites online, or you find yourself answering the door to a person serving you a Summons to Appear! -- The good reading stuff is the PDF's called Exhibit or Exhibits! You can view public PDF documents via source link below. What do you think about all this and what effect this has on the homebrew community? On the original PS3, there was an ON/OFF switch on the back. With the PS3 Slim, Sony removed it. With all the recent outbreak of open source jailbreaks that allows gamers to install homebrew applications, you must start the PS3 from a cold boot. 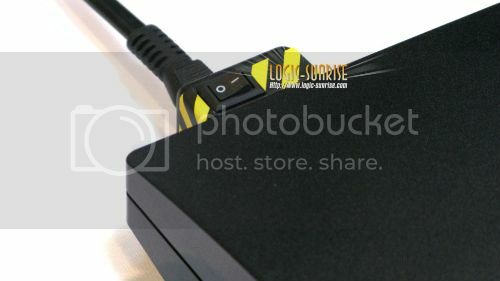 With original PS3, you simply flip the switch but with Slim owners, you must unplug and plug the power cable. This can be a big hassle especially if you're power cable is not easily accessible. This device retails for 19€ ($19.90USD) and is shipping to retailers now. The TEAM X3 is well decided to offer products of quality to us, and really useful. Thus, for all the owners of PS3 slim which are not equipped with a switch as on the FAT, the TEAM X3 thus developed X3 Switch, a module which connects between the console and the cable of slim in order to create a switch off-set on the top, by avoiding you the tiresome handling of the cable of slim between each starting of a dongle. Finally the price of the module should be in the neighbourhoods of 19€, costs carriage included/understood. The address of the site as for it is www.x3switch.com and it will be on line under a few hours. Updates the PS3 Slim to have the same ON/OFF feature as the older PS3s (Fat) have by default. Conveniently locate ON/OFF switch that fits securely to the back of your PS3 Slim. The X3Switch is a quality designed and manufactured product. Q1. What are the benefits of using the X3 Switch on my PS3 Slim? Q2. How does the X3 Switch save from wear and tear on my PS3 Slim? A. X3 Switch will save wear and tear by plugging in directly to the power port in the back of your PS3 Slim. This way you would not have to remove the power cord from your PS3 Slim only from the X3Switch or just turn if off. Then turn it on the next time you want to use your PS3 Slim. Q3. So the X3 Switch would be just like adding a switch like the PS3 (old Fat) systems have? A. Yes, that was exactly one of the reasons the X3 Switch was made to replace a feature that was left off of the PS3 Slim. Q4. How well does the X3 Switch attach to my Ps3 Slim? A. The X3 Switch was designed to fit tightly, securely and align up evenly with your PS3 Slim. Over the last 24 hours, various media outlets have reported on issues gamers are experiencing after downloading and installing the new ‘3.50’ Firmware for their PlayStation 3 video game systems. Mad Catz would like to take this opportunity to put gamers’ minds at ease. With the exception of a small quantity of controllers sold before 2008, we believe that all Mad Catz products will continue to function as they did prior to the 3.50 Firmware update including high profile products such as our range of Street Fighter IV™ FightSticks and Wireless FightPads; our range of controllers and accessories for Call of Duty®; our Cyborg F.L.Y. 9 Wireless FlightStick; our wired and wireless control pads; and our range of Rock Band™ accessories. Any consumer who owns a Mad Catz product and is experiencing an issue, including an issue with the PlayStation 3 Firmware update should contact Mad Catz customer services. Providing the product is within warranty, Mad Catz will be happy to offer a suitable replacement. ENTER NOW TO WIN!! LESS THAN 1 WEEK LEFT!! Since today starts the beginning of a new month, why not start it off with another contest!? We have teamed up with XCM again to give you a chance to win one of THREE XCM XFPS Fire Light Gun for the PlayStation 3! XFPS Fire Light Gun brings console first person shooters to a whole new experience. Bring the entertainment to your living room! With the XFPS Fire, you can snipe your foes with precision aiming using this light gun. No more having to move your thumbs or getting cramps. Simply point and shoot. What makes the XFPS Fire Light Gun even better is that it works for ALL first person shooters and is compatible with all PS3 systems. To enter, all you have to do is comment on this post. In order to posts comments, you must register first, if you aren't registered already. This contest is open to all gamers WORLDWIDE! Winners will be selected on October 1st. We will contact winners for mailing address and all items will be shipped by XCM. Thanks to everyone who enters and good luck. Remember to post a comment in order to be entered into the contest. Again, a big THANK YOU to XCM for providing the goods. DCEmu Reviews and DCEmu is not responsible for lost or damaged packages, damaged PS3s and/or electronic devices. All shipping of prizes are handled by XCM. 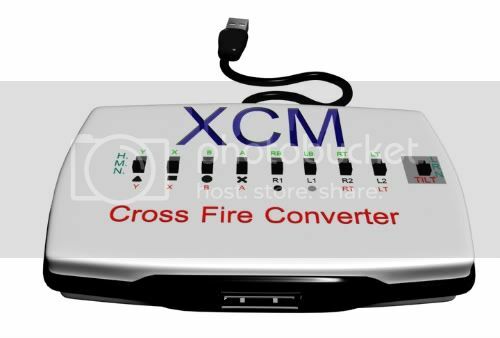 Any concerns in regards to XCM XFPS Fire Light Gun or shipping, please contact XCM at xcmcc@xcm.cc. 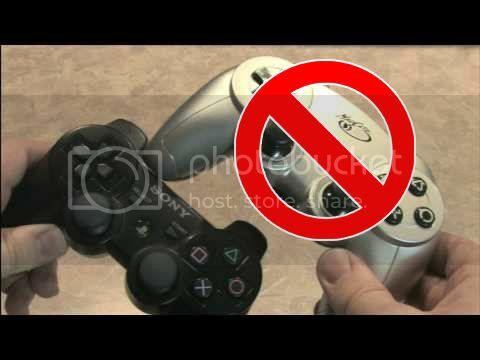 There were reports of people trying to use the SixAxis controller to Jailbreak the PS3. However, we stopped hearing about any progress on it and heard more about clones such as the PS3Key and P3Free and many others. 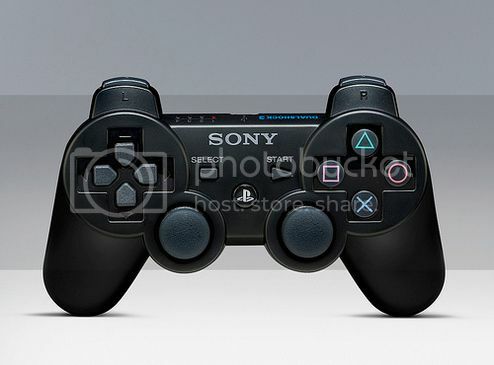 Now, there seems to be proof of a PSGroove port on a PlayStation 3 SixAxis/DualShock 3 controller! Forum user hasuky from http://www.elotrolado.net/ stated that he'll be putting more info online tomorrow. Starting by telling you, not to say bad words for those many people that maybe criticize the work of others without having done any research or evidence. I feel sorry for these people and for those who doubted in this project: I've spent a bit of my time and achieved what I wanted to do, not having a separate usb device, I wanted to run from the command Psgroove Sixsaxis and step be updatable via PC with just the controller and a USB cable for your bad luck has made the video I'm uploading it now takes a bit because my connection is shared. If you wait about 30 minutes more or less what you see, long time I was interested by the different consoles, as amended. I tell you to cool something that was the first to repair a bad nand extracted from a xbox 360, I have a couple of tutorials that many served him. And thanks to EOL and many people who make this forum what is now really. Tomorrow I will have to make the tutorial and make the respective tests. It seems that not only do you use the controller to jailbreak your PS3 but you can continue to use it like a normal controller. However, you would need to connect the controller via USB cable first. This is like a shot to Sony's heart considering modders are using Sony's own product to jailbreak their system. So after looking and reading a rough Google translation of the guide (which can be found HERE), it doesnt seem like its an actual port of the PSGroove onto the PS3 controller. Its more of installing a PIC inside the PS3 controller and wiring it to the USB port.